When you think of Maryland Cuisine… What do you think of? Is it Crabs… Scallops… Fresh Fish… All of the above?! Yes and more! Annapolis has so much delicious grub to offer, you’re sure to find something that makes you smile! Chart House is a Maryland treasure for sure. The menu is full of local ingredients and the restauranteurs care about the community they get those ingredients from. Formerly a historic boat house that was the primary shipyard for John Trumpy & Sons, Chart House seafood restaurant provides gorgeous views of Spa Creek. It certainly helps that a million dollar remodel has set the Chart House apart from the competition. Carrol’s Creek Cafe overlooks the waters of one of America’s most charming and historic cities. They offer the riches of the bay and the land in a new American style of cooking. Carrol’s Creek brings you tradition steeped in colonial town fashion, rich with seafood, culture, and style. Located on Restaurant Row in the historic maritime district of Eastport, the Boatyard is just a quick walk or water taxi ride from the Annapolis City Docks. The interior smacks of that of an old yacht, with shiny white walls, mahogany, sea foam green ceilings and large wooden beams. Whether you’re looking for breakfast all day, lunch, supper or drinks, at Iron Rooster you’ll find a new twist on traditional comfort food, wonderful hospitality, and a real sense of community. Since they can remember, they have dreamed of opening a restaurant where people feel at home from the moment they walk in the door. Here… the chicken is fried, the biscuits come with gravy, and macaroni and cheese is a vegetable. With Iron Rooster, they have created a place where their guests can enjoy mouthwatering, home-made dishes with unparralled southern hospitality and charm. Opened in 1998, Galway Bay has become a well-known Annapolis tradition, built on legendary Irish Hospitality. Galway Bay has been recognized as the Best Irish Pub every year since 2000, Best Bartender 2016, Best Trivia Night, featured in Diners, Drive-ins, and Dives, and most recently as a runner-up for “Best Irish Pub Global”. If it is your first time there, try their famous Fish and Chips, legendary Corned Beef Reuben, one-of-a-kind Shepherd’s Pie, or ask any of their friendly team members for recommendations on daily specials. Their Chef Kevin Duffy has recently returned from a menu study trip to Ireland, where he met with famous Irish chefs such as Darina Allen and Kevin Dundon. Miss Shirley’s Cafe offers their guests an award winning culinary experience for breakfast, brunch and lunch. Their specialties are rooted in Southern fundamentals and the abundance of fresh ingredients from the Chesapeake Bay Area of Maryland. They pride themselves on beautifully presented plates, prompt and professional service, as well as clean, comfortable and well-maintained premises for their guests. As a family-friendly, locally owned, upscale-casual restaurant, Miss Shirley’s Café evokes an energetic and welcoming atmosphere. By providing exceptional service, and preparing award-winning dishes, Miss Shirley’s Café has grown into a Maryland restaurant sought out by both locals and visitors alike. Imagine the scene, your on Spa Creek, looking out the window lit just by the light of the moon reflecting off the water and the boats coming in to dock. 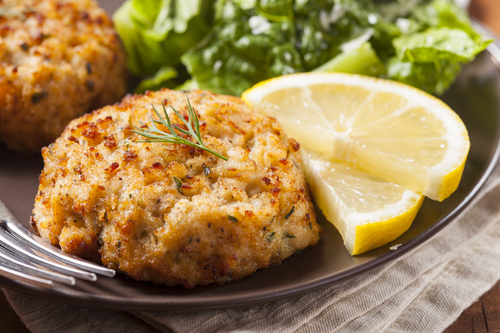 You take a bite of fresh crab cake next to your special someone. Can life get any better? Yes! You can stop imagining and start heading off to the seafood spot of your choice! Happy crabbing! Check out our next blog about the best breweries and distilleries in Annapolis!